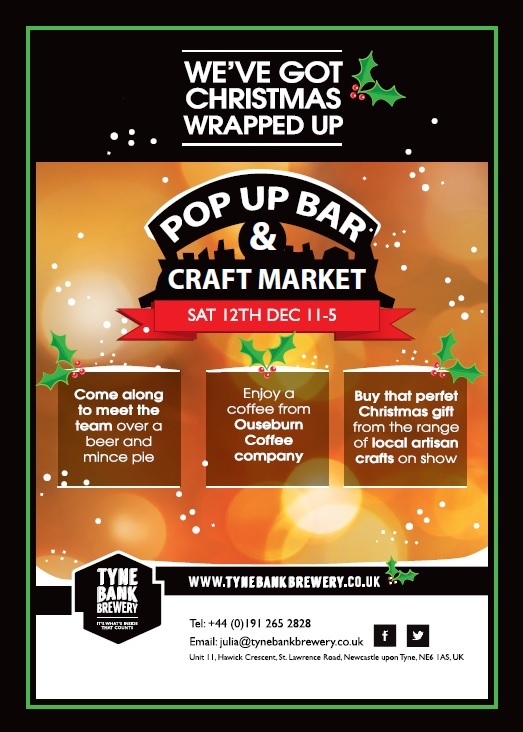 Tyne Bank Brewery: Christmas Market Day. On Saturday 12th December we are hosting a Christmas Market here in the brewery. A great chance to pick up some excellent local gifts and enjoy some brewery fresh beer while you shop. Away from the chaos and madness of the high street, come along to our brewery and choose from a wide range of gifts from top quality local producers and artists. Open from 11am til 5pm we're squeezing quite a lot into the brewery including chocolates, soaps, art, jewellery and more. Everything on sale is made locally, and you will be able to buy some unique and interesting gifts for Christmas at prices to suit every pocket. Of course we will be putting our pop up bar up for the day, so you can enjoy brewery fresh beer whilst you shop. We'll have cask and keg beers, and hot spiced cider to warm you up. Ouseburn Coffee will also be in attendance to keep you going. One very special beer we are excited about will be a one-off nitro keg of our December special, Creme Caramel. Using nitrogen instead of carbon dioxide to provide the condition to the beer results in smaller bubbles and a thick, creamy body. So if you want to try this luxurious version of the beer you will have to pop down on the day! As well as all the great local traders, we will be selling our full bottled range, gift packs and merchandise which make great presents. We'll also be taking orders for closer to Christmas for polypins, mini kegs and larger bottle orders so you can collect at your convenience. The Q2 bus stops very close to the brewery on Walker Road, so if you're in town getting some shopping done and struggling for ideas, pop along and escape the crowds, unwind with a beer and you will probably find the perfect gift you've been looking for. Bring your friends along and join us for a beer whilst supporting some great local producers.